Size: 13" x 4.42" x 11.25"
domestic shipping : This item is available for shipping in the U.S. except for California and to select countries outside the U.S.
No mounting hardware required, Ideal for bedroom and bedroom closets for purses, scarves, clothes, jackets, towels and more. Ideal for bedroom & bedroom closets for purses, scarves, clothes, jackets, towels & more. The iDesign York Lyra Over-the-Door Rack is so easy to use. There is nothing to install - just hang over your door and it is ready for use. No nails, screws or messy adhesives needed. Made of durable steel wire and a chrome finish, this over-the-door rack is a terrific asset to hang over any interior door. 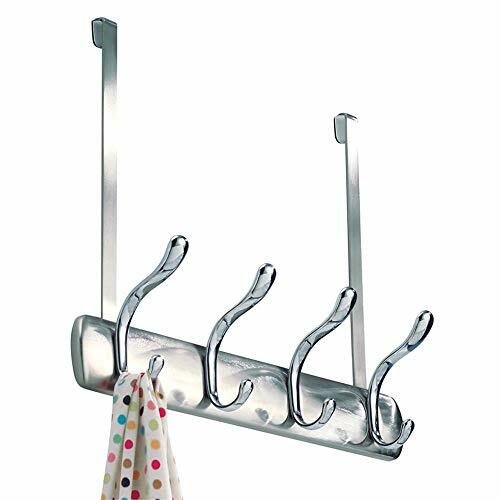 The York Lyra Over-the-Door Rack features 4 double hooks and is ideal for use in bedrooms and bedroom closets for purses, scarves, clothes, jackets, towels and more! Measuring 13" x 4.42" x 11.25", this over-the-door rack will provide the organization you dream of in your home. With iDesign by InterDesign, you can #livesimply every day. Size 13" x 4.42" x 11.25"
Domestic Shipping This item is available for shipping in the U.S. except for California and to select countries outside the U.S.